Eric lives on Capitol Hill and focused on video contributions to the blog. He contributed from 2008 to 2010. Sound Transit today re-opened the Northbound I-5 Olive Way exit ramp marking the completion of major work on one of the first contracts as part of the University Link Light Rail extension. The exit was closed for a year-long project to prepare I-5 for the twin tunnels that will be bored underneath connecting University Link into the existing system. Sound Transit reports the project was completed on-time and under budget despite earlier reports of being behind schedule, and considers this a great milestone for U-Link. Hot on the heels of the City Council approving the First Hill Streetcar line, the Capitol Hill Community Council’s Complete Streetcar Campaign (a group I’ve personally been involved with) is holding a kickoff party Tuesday evening to gather support and spread the word about efforts to extend the line further north and re-envision the Broadway streetscape. 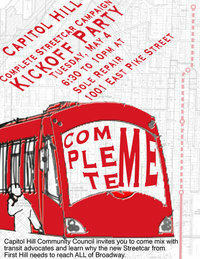 The event is Tuesday, May 4th from 6:30pm to 10:00pm at Sole Repair (1001 E Pike St) on Capitol Hill. Free food is being provided by area businesses. More information is available on Facebook. See you there! Transportation Choices Coalition hosted a bake sale at the Aurora Transit Center to raise awareness about the huge budget gaps currently facing local public transportation agencies. Plan to extend to Aloha St. The Aloha extension has been a consistent priority for Capitol Hill ever since the streetcar was first proposed. Even though funding for Aloha St is not yet secured, the extension should be fully designed and brought to a point of being “shovel ready” as part of this project, and the rest of the line should be designed in such a way as to maximize the feasibility of extending to Aloha. Keep the streetcar on Broadway north of Union St. This keeps the energy and focus on the retail corridor and makes the system simpler and easier to understand, a key factor in attracting new riders. The Cal Anderson Park loop raises safety and running time concerns and interferes with the community’s plans for the redevelopment of Sound Transit’s light rail station properties, particularly the plan to move the Farmer’s Market to Denny Way and Nagle Place. Reclaim the Street. 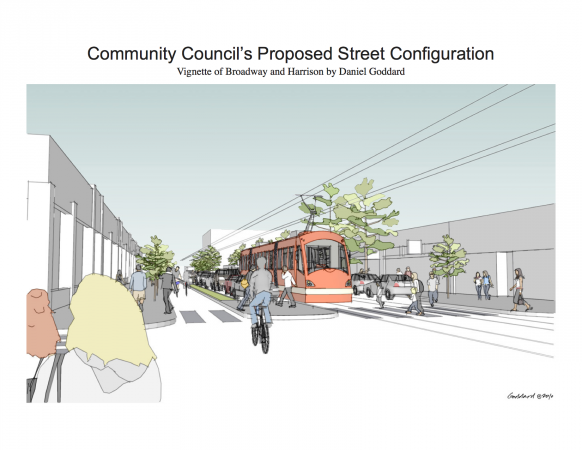 Make the streetcar a catalyst for reclaiming the use of the right of way on Broadway. Specifically, consider eliminating the center turning lane on Broadway except at the major intersections and repurposing this space for bicycle and pedestrian use. Also at the meeting, Ethan Melone from SDOT presented the different alignments currently being considered by the city. Although a two-way broadway option is being considered (in addition to various couplets), the current proposal from the city has the streetcar terminating on Denny between Broadway and 10th, which raised concerns from members of the community who are hoping to permanently close this section of the street (currently closed for the next six years for U-Link construction) and turn it into a pedestrian plaza as well as a permanent home for the Broadway Farmers Market. Concerns were also raised that this would preclude an extension north to Aloha. The Seattle City Council will make a final decision regarding the alignment in April, and construction is scheduled to start in fall of 2011. Ride Link to the Seafair Hydroplane Races! Thinking of heading down to the Seafair Hydro races? Take Link! A free shuttle (with standard Link fare) will be running Friday, Saturday, and Sunday between Othello Station and Stan Sayres Memorial Park. More information is available on the Seafair website, which also mentions that the park isn’t too far from Columbia City Station. It’s going to be a hot weekend, but we’ve heard the air conditioning on the trains is wonderful! Shortly after 5pm today, a car traveling on Martin Luther King Jr. Way South made an illegal turn against a red light and was hit by a passing Link Light Rail train. The driver of the car sustained non-life-threatening injuries and was transported to the hospital. We’re awaiting word about the train’s condition, but hopefully any damage was minor and it’ll be out looking beautiful on July 18th in just 18 days. The best photos are available at the Rainier Valley Post. This incident comes one day after we reported about John Niles’ suggestion that Sound Transit be liable for all car vs. train incidents, even in cases like this when the driver made an illegal turn. Despite who’s at fault, the city is looking for ways to make the area safer. Earlier today before this accident, KIRO posted a story about merchants who are opposed to the installation new barriers designed to prevent car/train collisions, claiming they would hurt business. According to the story, a few business owners are threatening to block the track on opening day in protest. Seattle Transit Blog would like to remind our readers that standing on any railway, regardless of political motivation, is a very bad idea, and that your chances of successfully stopping a 2-car train are very low. Also tonight in the Capitol Hill neighborhood, home to many STBers, a family crossing the street was hit by a car. There aren’t a lot of details about this incident yet, but Capitol Hill Seattle reports that at least three people (two of them young children) were transported to the hospital with non-life-threatening injuries, and Seattle Police arrested the driver at the scene. Hopefully everyone injured will recover quickly. To John: should these children be responsible for the driver’s legal fees? Or maybe the city for not grade separating all the crosswalks? Sound Transit has lots of information about staying safe around Link on their website, including a guide for drivers. Hopefully for real this time! A group of excited transit geeks (myself included) waited patiently 9:00am Monday at International District Station for the first Link train to roll through, only to find out that testing was canceled due to a problem with the tunnel’s control system. Fortunately multiple sources report that testing will indeed begin tomorrow (Wednesday May 20th). A few of us will be back at International District Station around 10am to ogle. If you’re in the area, be sure to stop by and join the excitement! Sound Transit plans to give bus and train operators two months of real-time experience before service begins in just under 60 days. asset assessment by the joint transportation committee. You may remember that the last study requested by the state confirmed that the I-90 bridge can handle light rail. Much of our state government remains opposed to building light rail across the water despite overwhelming support from the voters. Perhaps these representatives are under the illusion that if they keep requesting new studies, one will eventually tell them what they want to hear. Unfortunately there isn’t much time left to influence this budget. There’s a public hearing today at 3:30pm (stream), with an executive session closely following tomorrow at the same time. Full agenda here. We’ll have more information on all this later tonight. With demolition to make way for light rail beginning on Capitol Hill, and the possibility to see streetcar construction start next year, the neighborhood is in for a long haul of non-stop construction for the foreseeable future. Since streets around the area will be torn up anyway for this construction, I began to wonder if this might be a great opportunity to rethink how to make them better for not only cars but bicycles, transit, and people, rather than put everything back exactly as it is now. I quickly found that I wasn’t the only one envisioning better streets, and now that the discussion has started about what to do with the land above the station once construction is complete, it seems like the perfect time to start the conversation. Anyone interested is invited to an informal community discussion this Friday 7:00pm at Moe Bar (please RSVP). Learn more about the streetcar project, and share your ideas for how to make Capitol Hill an even more vibrant, walkable community. How’s that for “shovel ready”? 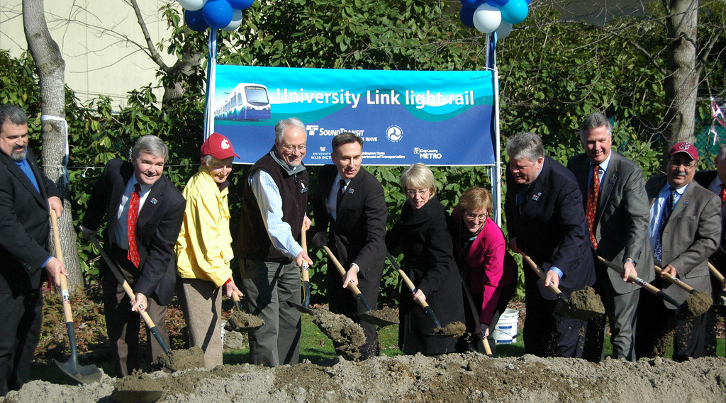 Sound Transit broke ground today for University Link, the extension of light rail from Downtown Seattle through Capitol Hill to the University of Washington at Husky Stadium. Initial work involves utility relocation, making way for station and tunnel excavation scheduled to begin late this year and last approximately three years. The groundbreaking marked the beginning of the end of the 1996 Sound Move plan, and was a day many who worked on this original plan thought would never come. Today’s milestone is certainly something to celebrate. When completed, U-Link will offer a seven minute ride between Downtown Seattle and the University, and Sound Transit estimates the U-Link line alone will add an incredible 70,000 daily boardings to the system by 2030. Martin also mentioned yesterday that bringing light rail further north offers many opportunities to improve bus service for the area. In the shorter term, University Link will generate an estimated much-needed 2,900 direct construction jobs and 22,800 other direct and indirect jobs as result of economic activity generated by the project. Even though I’m extremely excited for July when Central Link opens, I already can’t wait for 2016! Last week Zipcar, the local car-sharing company, announced a partnership with the City of Seattle and opened a new retail-style office downtown. A few months ago, I posted about a video from the Obama Transition Team that mentioned the need to invest in Mass Transit. Since then, we’ve become increasingly worried about if the Obama administration will include transit projects in the stimulus package. What sort of transit projects could we see in our region as part of the stimulus package? Stay tuned. It’s been fashionable recently to call for various snowstorm service improvements that are somewhat expensive. To simply say “there ought to be more service” begs the question of “how?” Should the city or county buy more plows? Use salt? Buy more tow trucks? Would you prefer these kinds of things to, say, a significant number of new bus shelters for use year-round? Since heavy snow isn’t a common occurrence here in Seattle, we don’t think it’s unreasonable that the city essentially accepts crappy service on the rare occasion when this kind of thing happens. The debate about changes to policy and if we should spend lots of money on plows, etc. will continue, but we’d like to focus now on small improvements that could be made quickly and inexpensively. Most of these small improvements are, in my opinion, related to operational management and communications. One of the few things worse than your bus being canceled is not knowing about it, and waiting around for hours at the stop in the cold. After the fold is an initial by-agency brainstorm, including some things that went well. Red Monorail train stalls yesterday and again today. Among those stranded yesterday was Robert Baker, who drove the train on opening day of the 1962 World’s Fair. Port of Seattle suspends construction on massive new rental car lot. We’ve mentioned this project in the past. Just tear it down already: Drivers complain about viaduct replacement options not providing enough open road for their gas guzzlers, slog rightfully tells them to tough it out. So, how do we deal with the traffic problem? Both plans include money for a West Seattle BRT line, and new 1st ave streetcar. Driver injured in collision with Amtrak Cascades train, after apparently turning under the crossing arm. Really? To the white house in style: President and Vice President Elects Obama and Biden will take the train to the Inauguration, holding events along the way. Metro is preparing for next round of snow, hoping to avoid ending up in any more hilarious youtube videos. You can see a list of active bus reroutes here, and general information about adverse weather here. Remember that many buses, such as the 71 (scroll to the bottom), have a predefined snow reroute. Update: Andrew posted more information about all this. If you have to drive tomorrow, please do be careful. Yesterday in his weekly address, President-Elect Obama announced that his transition team is working on a two-year, nationwide plan to create jobs rebuilding the country’s infrastructure. The President-Elect specifically mentioned improving roads, bridges, schools, and investing in clean-energy. A member of the Obama-Biden Transition Energy and Environment Policy Team posted a followup video specifically mentioning the need to invest in mass transit as part of this plan (around 1:50 in the video). We all have an amazing opportunity to have a part in ensuring the success of this plan, and seeing real change throughout the country in the near future. Here on STB, we’ve started talked about what’s next, and we’ll continue to post about how everyone can get involved. It sounds like we will soon have an ally in the White House, and I am hopeful that 2009 will turn out to be a very interesting year. You can share your ideas at obamaurbanpolicy.org. Be sure to also let us know in the comments what you propose. Americans still driving less despite lower gas prices, are you? Tony Douglas is a good example. Douglas, 46, gave up driving the 26 miles from Gallatin, Tenn., to his office in Nashville in September, when gas prices were still high. He took a bus instead. Driving cost him $8 to $10 a day while the bus was $6. Now that gas prices have dropped and the cost benefits are gone, he’s still on the bus. Amusingly, I saw this article a few hours after talking to someone about how I thought there were noticeably fewer cars on the road back in summer when gas prices were at their highest, and that I thought roads were looking more crowded again recently since gas prices have fallen. Am I crazy? What are your observations? Have you or anyone you know made any driving habit changes this past year? Share your stories in the comments. Sound Transit’s latest photo of the week is the first I had heard of this project. It looks amazing. If you’re a regular reader of this blog, you know that Proposition 1 would extend Link Light Rail by 36 miles into the region’s major employment and residential centers. You also know that trains carry more people than buses, cost less to operate, last longer, and are more enjoyable to ride. We all look forward to the day when we can hop aboard a beautiful, quiet, and efficient train right here in our home town and get where we need to go. We all know that this proposition must be approved. But to me, Link is more than just a train. Every one of us has faced challenges this past year – war, the financial crisis, climate change, gas prices… amidst everything, it’s very easy to loose hope for the future. We all have an opportunity right now – today – to create a future designed for us – not automobiles. A future where we no longer give our hard earned money to overseas oil companies that are destroying the planet and funding terrorism, or to auto companies who lie to us every day claiming that their gas guzzling cars get good mileage. A future that can co-exist with the planet, and not destroy it. And most importantly, a future where we can enjoy more time out in a great city with friends and family, instead of alone enclosed in a small box stuck in traffic. Proposition 1 will further transform the area we love into something even more amazing. It starts with a train, but it leads to something much, much more amazing: a better future for everyone. This is why I am voting yes on Proposition 1 today, and why I hope you will too. When was the last time you were stuck in gridlock at 5am? At the recent debate between Kemper Freeman and Mayor Greg Nickels at the UW, Freeman accidentally seconded the argument for more mass transit: It helps rush hour commuters. The opposition has no alternative plan, and they don’t even understand the problem. Don’t let them ruin the region’s future. Vote YES on Sound Transit Proposition 1 November 4th (it will be at the bottom of your ballot – don’t be confused by your local city prop 1)! You can read our full list of endorsements here. Even though the election is just days away, there’s still lots to do. Talk to all your friends, coworkers, and random strangers (girls love it when you talk about trains) and make sure they understand how important this proposition is. As always, visit the official ‘yes’ campaign website at http://www.masstransitnow.org/ for more information. Yesterday’s car-free day at Alki was great! There were well over a thousand people attending throughout the day, and most of them were on bicycles. Everyone had a great time finding better uses for the road, and all the businesses we talked to were very enthusiastic about the event, and some even said it was one of their busiest days of the year! I noticed right away the lack of road noise, it really makes the beach much more pleasant. There were a few local groups and businesses promoting sustainability, I put together a short video with a friend interviewing a few of them. We biked from Capitol Hill to the Elliott Bay Water Taxi on Pier 55 which goes right to Alki. The boat was more than half-full, and more than half of the passengers had bikes! It’s a great ride, I highly recommend everyone try it out on on a nice day if you haven’t before – it’s only $3.00 and is great for out of town guests! The taxi is a great example of how innovative public transportation can really make people happy. There was a lot of interest in future car-free days, especially in Ballard and Freemont. Where would you like to see new car-free days next year? I’m hoping for Broadway (between Pike and Roy) on Capitol Hill, and one of the major avenues Downtown.